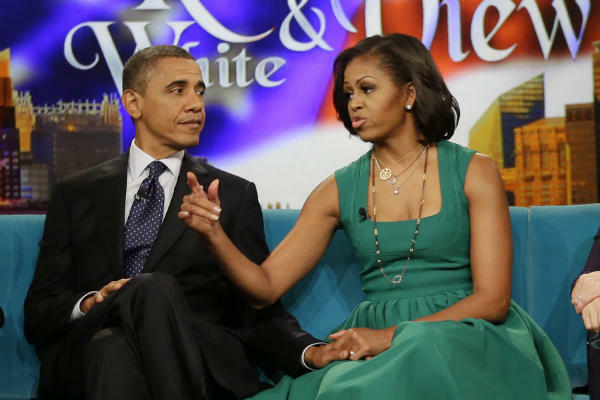 *The First Couple’s appearance on “The View” this week pulled 4.3 million viewers, giving the show its highest rating in four months – since President Obama’s last appearance on the ABC daytime show. His last appearance on the ABC daytime talker in May drew 4.7 million viewers. In adults 18-49, The View raked in an impressive 1.1 million. The broadcast marked Obama’s fifth appearance on the show since making his debut, then a senator, in September of 2007. Obama has been a ratings boon for many this election season, according to The Hollywood Reporter. Last week’s “David Letterman” visit drove “The Late Show” to a two-year overnight high. In the leaked tape that has given him such a hard time of late, GOP nominee Mitt Romney referred to “The View” as “high risk” for its liberal-leaning panel, though outwardly conservative panelist Elisabeth Hasselbeck subsequently announced on air that Romney and his wife, Ann, would appear before the election. Next ArticleNicki Minaj to Star in Her Own E! Reality Series?